Normally the cell membrane isolates a cell from the adjacent tissue. As a consequence, any cell-to-cell message must first transit the cell membrane. One exception to that arrangement is a feature found in cardiac and smooth muscle cells: the gap junction. 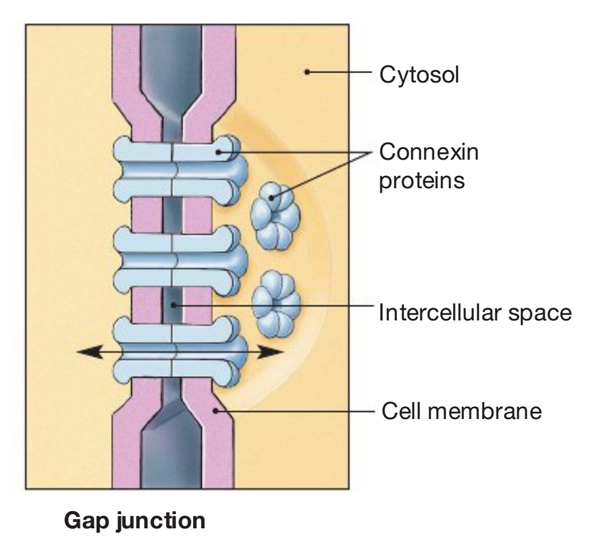 A gap junction is a direct pathway that joins the cytoplasm of adjacent cells formed by connexin proteins. When open, this pathway provides a direct electrical connection between the cells. An action potential generated in one cell will spread through all adjacent cells that are connected by an open gap junction. This arrangement allows a group of cells to function as a syncitium, a single unit. Autocrine, paracrine, endocrine, and neurotransmitter signaling all involve the release of an agent from one cell into the extracellular space and the subsequent binding of the agent to a receptor on a target cell. For autocrine actions, the receptor is on the same cell that released the signal. For paracrine signaling, the receptor is in a cell in close proximity to the signaling cell. The distance is increased even further with endocrine signaling, which requires that the signal molecule be transported by the blood to reach the target tissue. Neurotransmitter signaling is a special case in which agents released from the axon terminal diffuse over a short distance to the postsynaptic target cell. Characterization of a signaling molecule as an endocrine, autocrine, or paracrine agent is difficult since one molecule can serve each of these purposes in the same system. Norepinephrine released from a sympathetic nerve terminal will bind to an a2-adrenergic receptor on the presynaptic axon terminal (autocrine), bind to the postsynaptic cell receptor (neurotransmitter), and diffuse away from the synaptic cleft, where it can bind to receptors on adjacent cells (paracrine) or diffuse into the circulation, where it can be carried to distant cells (endocrine). Cells communicate by releasing extracellular signaling molecules (e.g., hormones and neurotransmitters) that bind to receptor proteins located in the plasma membrane, cytoplasm, or nucleus. This signal is transduced into the activation, or inactivation, of one or more intracellular messengers by interacting with receptors. Receptors interact with a variety of intracellular signaling proteins, including kinases, phosphatases, and GTP-binding proteins (G proteins). These signaling proteins interact with and regulate the activity of target proteins and thereby modulate cellular function. Target proteins include, but are not limited to, ion channels and other transport proteins, metabolic enzymes, cytoskeletal proteins, gene regulatory proteins, and cell cycle proteins that regulate cell growth and division. Signaling pathways are characterized by (1) multiple, hierarchical steps; (2) amplification of the hormone-receptor binding event, which magnifies the response; (3) activation of multiple pathways and regulation of multiple cellular functions; and (4) antagonism by constitutive and regulated feedback mechanisms, which minimize the response and provide tight regulatory control over these signaling pathways. A brief description of how cells communicate follows. Readers who desire a more in-depth presentation of this material are encouraged to consult one of the many cellular and molecular biology textbooks currently available. Cells in higher animals release hundreds of signaling molecules, including peptides and proteins (e.g., insulin), catecholamines (e.g., epinephrine and norepinephrine), steroid hormones (e.g., aldosterone, estrogen), iodothyronines (e.g., thyroid hormones, including thyroxine [T4] and triiodothyronine [T3]), eicosanoids (e.g., prostaglandins, leukotrienes, thromboxanes, and prostacyclins), and other small molecules, including amino acids, nucleotides, ions (e.g., Ca++), and gases, such as nitric oxide (NO) and carbon dioxide (C02), into the extracellular space by the processes of exocytosis and diffusion. Secretion of signaling molecules is cell type specific. For example, beta cells in the pancreas release insulin, which regulates glucose uptake into cells. The ability of a cell to respond to a specific signaling molecule depends on the expression of receptors that bind the signaling molecule with high affinity and specificity. Receptors are located in the plasma membrane, the cytosol, and the nucleus. Signaling molecules can act over long or short distances and can require cell-to-cell contact or very close cellular proximity. Contact-dependent signaling is important during development and in immune responses. Molecules that are released and act locally are called paracrine or autocrine hormones. Paracrine signals are released by one type of cell and act on another type; they are usually taken up by target cells or rapidly degraded (within minutes) by enzymes. Autocrine signaling involves the release of a molecule that affects the same cell or other cells of the same type.